Besides, that’s exactly how Katie and Matt feel about their love story so far—a love that began through their interest in sports and that has grown deeper through their mutually strong Catholic faith. “It’s divine intervention at its best,” said Matt as he sat next to Katie in a coffee shop on the north side of Indianapolis. 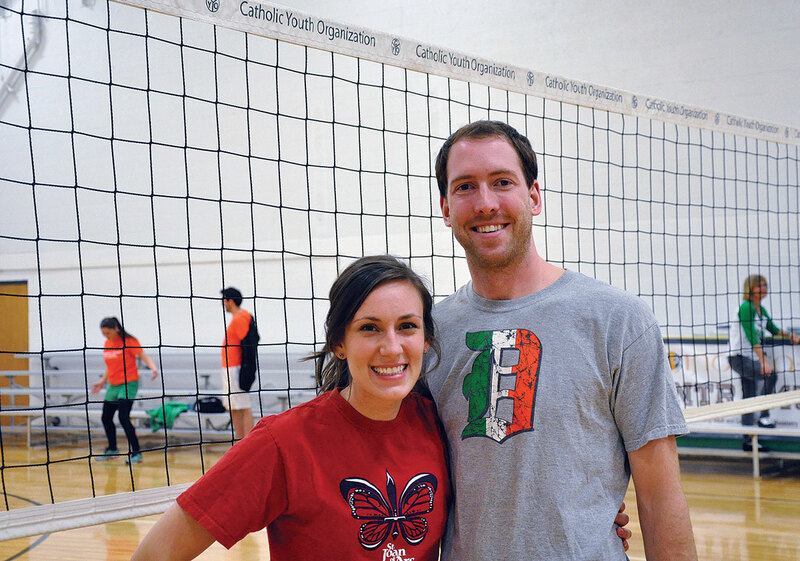 Katie and Matt, both 26, were randomly assigned in early 2014 to the same volleyball team during the first season of the IndyCatholic Young Adult Intramurals program. It’s also led to another kind of deep, personal connection between Katie and Matt, neither of whom imagined that they would be engaged to each other just 10 months after they met as strangers. 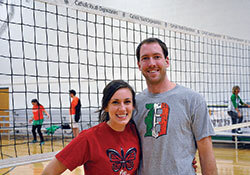 Two main interests guided Katie as she stepped onto the volleyball court for the team’s first game last winter. She enjoyed sports, having played basketball and soccer at Bishop Dwenger High School in Fort Wayne, Ind., where she grew up. The 2011 graduate of Marian University in Indianapolis also hoped to make some new friends near her age who shared her Catholic faith. Matt also had two reasons for joining the volleyball league. After moving from Michigan to Indianapolis for his first job as a civil engineer in August of 2013, Matt still counted his dog, Master Toby, as his best local friend when the brutal winter of 2013-14 sent the city into a prolonged, deep freeze. Realizing that Matt needed more human connection, his librarian-mother looked online from her home in Michigan and learned about IndyCatholic Young Adult Intramurals. When Matt and Katie played for the first time on the court together, neither of them were thinking it would eventually lead to a courtship. At the same time, the leaders of the intramurals program encourage the idea that teammates and other players should hang out together before and after games, emphasizing the social connections more than the sports competition. As Matt and Katie individually joined those larger groups, it came out that Matt was involved in a long-distance relationship. Yet the more they were around each other, there was no denying there was an attraction between them. “I started to like Katie for the qualities she has—her genuine kindness and loving nature, and she tries to include people in things, and her competitive nature,” Matt noted. Their friendship continued in group settings after the volleyball season ended. And when the intramurals program had a sign-up for a kickball season, they decided to form a team together. When Matt knew his feelings for Katie couldn’t be denied, he ended his long-distance relationship in May. A month later, he asked Katie for a date. Katie soon learned that his feelings were matching hers. Matt promised that commitment when he proposed to Katie on Christmas Eve after the midnight Mass at her family’s church in Fort Wayne—St. Vincent de Paul Church. Katie said yes, and the celebration began as they were soon surrounded by her parents and many of her seven siblings. A phone call to Matt’s delighted parents followed shortly. They plan to be married in that same church on July 25, during a Mass concelebrated by two of her older brothers who are priests in the Diocese of Fort Wayne-South Bend—Father Matthew Coonan and Father Terrence Coonan. Their shared belief includes the wonder and the joy of a journey that has taken them from strangers to teammates to friends to an engaged couple.